1991: Did not join the Storm until just before the Albany game (6/29) after playing with the Orlando Thunder of the World League...Caught a touchdown in that initial game and added two more in a 38-29 upset win over Detroit one week later (7/8)...Had 17 catches for 305 yards and eight touchdowns in just six games...Became a star in the postseason; he began by catching seven passes for 127 yards and three touchdowns in the Storm's 40-13 semifinal dismantling of Denver (8/10)...Named MVP of ArenaBowl V (8/17) by virtue of his five-catch, 117-yard performance that included an ArenaBowl-record four touchdowns...Caught a 35-yard game-winning touchdown pass from Jay Gruden with 39 seconds left...Also had a 42-yard touchdown on a catch-and-run from Gruden on the last play of the first half, an "untimed down" made possible by a Detroit penalty on the previous play. 1992: On a game-by-game basis, his best season...Set a career mark with 199 yards in receptions at Dallas (6/27)...Established career-highs with 1,203 yards receiving and 26 touchdowns receiving...Per-game averages of 120.3 yards receiving, 6.7 catches and 2.6 touchdowns made his selection to the All-AFL team as an offensive specialist an obvious one...At the time, his 26 touchdown receptions were a league record...Caught six passes for 89 yards and a touchdown in semifinal win over Cincinnati (8/8). 1993: Caught 56 passes for 972 yards and 23 touchdowns in 12-game season...Had his best season on special teams, as he returned 38 kicks for a career-high 637 yards...Led the Storm in receptions, yards receiving, touchdowns, kickoff returns and missed field goal returns...In playoffs, caught 13 passes for 196 yards and four touchdowns to help the Storm to its second ArenaBowl title. 1994: Led team in receptions, receiving yards and touchdowns for third straight year...Caught 12 passes for 187 yards and three touchdowns in 51-50 win over Massachusetts (7/23). 1995: Moved to WR/LB from offensive specialist at behest of new coach Tim Marcum, who wanted to get Thomas and George LaFrance on the field at the same time; they had split time at offensive specialist in 1994...Finished first on the Storm in receptions (67), receiving yardage (1,002) and receiving touchdowns (18)...Caught 11 passes for 158 yards and three touchdowns in loss at Albany (6/17)...Made what is probably the defining play of his career in the semifinal win over Albany when he picked up a loose football in the end zone, sidestepped seven Albany defenders and ran 54 yards for a touchdown off a kickoff return with just seven seconds left to give the Storm a 56-49 triumph...Also had eight catches for 102 yards in that win over Albany (8/18)...On defense, he added 20 tackles and 11 assists on the season, picked off two passes (scoring touchdowns on both) and recovered two fumbles. 1996: Finished second on the Storm in receptions (74), yards receiving (1,089) and receiving touchdowns (21)...Added a touchdown rushing and another on a 26-yard interception return at Memphis (6/22)...Named AFL Player-of-the-Week for his exploits in the Storm's 65-52 win over Albany (7/12)...in the win over the Firebirds, he caught touchdown passes on 4th downs in the last minute of regulation and overtime to help propel the Storm to the come-from-behind win...Named to the All-AFL second team at WR/LB...For the second time in his career, he was named MVP of an ArenaBowl...In ArenaBowl X at Iowa (8/26) he caught seven passes for 103 yards and two touchdowns; he also scored on a nine-yard interception return late in the second quarter to give the Storm a 28-21 lead. 1997: Finished second on the team in receptions (54), receiving yardage (733) touchdowns (12) and interceptions (two for 48 yards)...Began the season by catching five passes for 61 yards and a touchdown and adding three tackles at Arizona (5/3)...Had his best receiving night of 1997 one week later, hauling in 11 passes for 145 yards and three touchdowns against Florida (5/10)...That effort earned him Game MVP honors...Had five catches for 70 yards at Nashville (5/23)...Intercepted a pass one week later against Milwaukee (5/30)...Had four catches for 47 yards, a touchdown and three tackles at Albany (6/7)...Caught three passes for 43 yards, recorded two tackles and broke up a pass against New Jersey (6/14)...Scored a touchdown and had three tackles against New York (6/20)...Led the Storm with four catches for 60 yards, including a 30-yard touchdown catch, in the loss to Orlando (6/27)...Returned an interception 42 yards and had two catches for 36 yards and a score at Texas (7/5)...Named Game MVP after catching four passes for 100 yards, including a 38-yard touchdown on the last play of the first half, and making three tackles against Anaheim (7/12)...Caught four passes for 50 yards and scored once against Florida (7/26)...Had two receptions for 14 yards before going down with an injured thumb at San Jose (8/2)...Thumb injury sent him to the inactive list for the first-round game at Nashville (8/10)...Returned for the semifinal at Arizona (8/16) with a cast on his hand; although he did not post any offensive stats; he heroically recorded three tackles on defense. 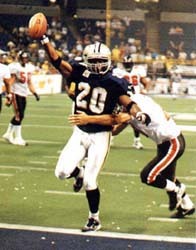 1998: Finished the season as the Storm's leader in receptions with 76...Was second on the club with 912 yards and 16 touchdowns...Hauled in five passes for 44 yards and made two tackles and one assist at San Jose (5/1)...Scored on a three-yard touchdown grab...Returned one kickoff for seven yards...Against Nashville (5/9), he caught seven passes for 107 yards and a touchdown...Brought in a 41-yard reception on 4th-and-15 in the final minute to keep the Storm's final scoring drive alive...On defense, made two tackles and two assists...Caught three passes for 33 yards against Houston (5/16)...Went over the 800-point mark for his career by scoring two touchdowns on passes from Peter Tom Willis at Florida (5/23)...Finished the game with five catches for 41 yards and added a tackle and an assist on defense...At New Jersey, he caught six passes for 79 yards and a fourth-quarter score, a nine- yard pass from Peter Tom Willis...Against New York (6/6), he led the Storm with eight catches and 76 yards receiving...Scored on a four-yard pass from Peter Tom Willis early in the second period; the ensuing two-point conversion gave the Storm a 17-10 lead...Made one tackle on defense...Attempted an option pass for George LaFrance in the first quarter which fell incomplete...Caught four passes for 39 yards, including an 18-yard leaping grab for a score on the first play of the fourth quarter at Orlando (6/12); that score put the Storm up for good, 29-28...Defensively, he recorded two unassisted tackles...Added to his career legacy of big games against the Albany Firebirds (6/20) with his best night of the season...Posted season highs in receptions (9) and receiving yardage (128)...Also set a career high by scoring four times on passes...Got started on the Storm's first offensive play, going deep down the left side and hauling in a 41-yard scoring pass from Peter Tom Willis...Bookended his great performance by providing the Storm's final score of the night, fielding an onside kick from Albany's Pete Elezovic at the Firebird four-yard-line and running in unimpeded for a touchdown with six seconds remaining in the contest...Earned Game MVP honors for his efforts...Punctuated the home win over the Predators (6/27) with a lunging, one-handed stab in the right corner of the end zone for his only score of the night, a 15-yard pass from Peter Tom Willis with 6:55 left in the game...Broke up his first pass of the season and added two assists defensively...On offense, was second on the team in receiving yards with 76 on five catches...Led the Storm with 117 yards on eight catches...Turned in his third 100-yard game of the season and his second in three weeks...Broke up a pass for the second consecutive game...Recorded two unassisted tackles...Against Florida (7/12), he caught four passes for 37 yards and a fourth-quarter score on a fourth-down pass from Peter Tom Willis with 5:02 remaining...Made one tackle on the defensive side of the ball...Caught three passes for 50 yards at Nashville (7/17) and made three unassisted tackles..Started the Storm's 71-point scoring deluge against the Barnstormers (7/25), catching a four-yard touchdown pass from Peter Tom Willis less than three minutes into the game...Caught three passes for 27 yards and notched two total tackles...Closed the season at Grand Rapids (8/1) by hauling in two second-half touchdown catches, of seven and three yards...Led the Storm with six receptions, going for 58 yards....Broke up a pass on defense and posted three tackles, two unassisted...Finished second on the Storm in receiving in the postseaosn, catching 13 passes for 165 yards and two touchdowns in the three games...Caught six passes for 86 yards and one score in the first round win over San Jose (8/8)...Hauled in five passes for 50 yards against New Jersey (8/14)... Scored on an eight-yard touchdown pass in ArenaBowl XII (8/23); however, the score was a case of too little, too late, as it pulled the Storm within 56-31 early in the fourth quarter. 1999: Opened the season by catching five passes for 63 yards against Albany (4/24), but recorded no statistics on the defensive side of the ball...Scored on two long touchdowns against Milwaukee (4/29), both on passes from two different quarterbacks---one of which happened to be Milwaukee's Todd Hammel... Thomas picked off a Hammel pass from his jill linebacker position midway through the second quarter and, with the help of a block from Andre Bowden, raced 37 yards for the score and a 28-7 lead... When Milwaukee drew to within 28-27, Thomas responded, catching a 43-yard pass from Peter Tom Willis for his second score of the night...Thomas ended the game with three catches for 71 yards...Had the highlight of the game against Florida (5/15) when he scored on a 17-yard touchdown reception in the second quarter. What made the catch special, though, was that he snared it with one hand while flying down the sideline just inches from the padded wall...The catch was his only one of the night; he added a tackle and an assist on defense. Career Highlights: Is one of three players remaining from the 1991 championship team, the others are Andre Bowden and Tracey Perkins...Is the Storm's all-time leader in receptions, yards receiving, receiving touchdowns, overall touchdowns and points.